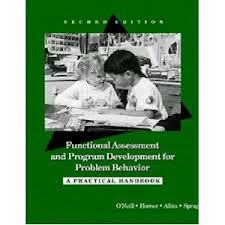 Functional Assessment and Program Development for Problem Behavior: A practical Handbook by Robert E. O’Neill. This guide to functional assessment procedures includes a variety of strategies for assessing problem behavior situations, and presents a systematic approach for designing behavioral support programs based on those assessments. Professionals and students will appreciate the way the authors help readers learn to conduct functional assessments and develop their own intervention programs. Pp.144. This entry was posted in Behavior Modification, Our Library and tagged Autism Spectrum Disorder, behavior modification, books, functional analysis. Bookmark the permalink.